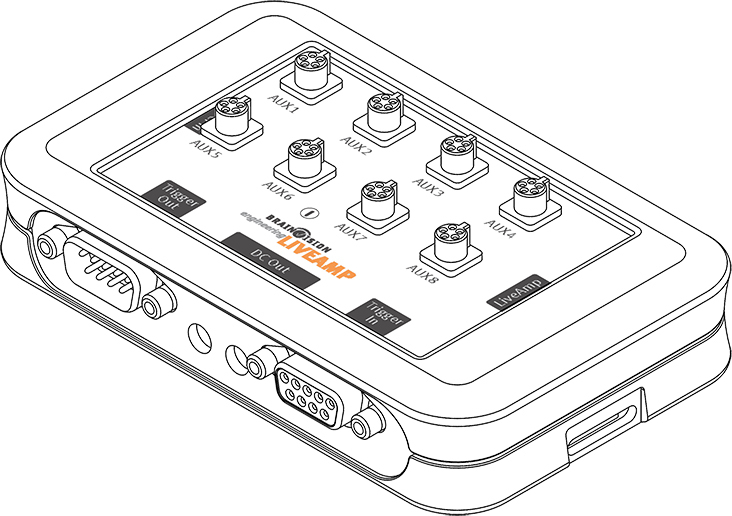 The additional inclusion of sensor signals into your mobile EEG research with the LiveAmp is as easy and flawless as 1, 2, 3. Just connect the sensor and trigger extension to the LiveAmp from one side and to a standard power bank (as used for any mobile phone) on the other side. Thanks to the included belt clip, you do not even need to worry about fixing the sensor and trigger extension to the subject. All LiveAmp sensor and trigger extension connections are compatible with all Brain Products sensors currently on the market. In addition to the 8 auxiliary (sensor) inputs, the sensor and trigger extension offers a connection possibility for 8 Input triggers and a connection possibility for 8 output triggers via common standard 9 pin D-Sub connection sockets. I guess there is no need to explain the importance and the use cases for an 8-bit trigger in port, but what can be done with a trigger out port? The options to control external stimulators or other devices via the trigger out port are manifold. We decided to offer 2 options as standard for the initial product launch. Option 1 is to mirror the 8-bit trigger in, this means when a trigger pulse is received from an external stimulator it is transferred immediately (without delay) to the corresponding bit at the trigger out port. With that, trigger information can be distributed to additional recording devices (e.g. eye trackers) or it can be used to trigger another stimulator. Option 2 is to use the trigger out port for the synchronization with other recording devices, again a good example here, is eye trackers. The output bit used and also the sync. out frequency for the synchronization, are user definable and can be set in the recording software, BrainVison Recorder. Combining advanced technology, highest quality standards and excellent signal quality with ease of use, is the core aim of Brain Products philosophy for new product developments. The trigger and sensor extension meets these ambitious criteria and we are convinced it will contribute greatly to your day to day research work. If you want to receive more detailed information on features, pricing etc. for this exciting new add on for your LiveAmp amplifier please contact your local Brain Products distributor or alternatively sales@brainproducts.com.